…a house full of stuff can be very depressing. A cluttered room saps one’s spirits. One reason, obviously, is that there’s less room for people in a room full of stuff. But there’s more going on than that. I think humans constantly scan their environment to build a mental model of what’s around them. And the harder a scene is to parse, the less energy you have left for conscious thoughts. A cluttered room is literally exhausting. I absolutely agree with this statement. The more stuff I have lying around, the less focused I am, and therefore the less space there is in my skull to think about other things. I consider that wasted time, as who knows what kind of thoughts might have arrived? I suggest reading the whole article as it articulates well the curse of ‘stuff’. I like the tone of the piece as it doesn’t expect a monk-like lifestyle, just that you maintain a strong mindset during moments of potential vulnerability, i.e. when in a store. As I’ve stated before, never think that marketing just happens by accident. At its best it’s a complex process of coercion. At its worst it’s an extremely effective system of indoctrination. Simply being aware of the game gives one a better chance of beating it, or at least learning to live with it. First, I will say that you are on a roll today with these posts! Second, I agree that clutter can be depressing. I never understood how the people on those TLC shows exist (The ones where they are complete and total pack rats and need help to get rid of all the useless crap they don’t need. They barely have enough room to fart in their homes without running the risk of having their house topple over if they do). I don’t think I could live like a minimalist either because I do like stuff, but I will forgo my room dedicated to the collection of “Golden Girls” memorabilia to save myself from depression. P.S. I think I’m going to clean my room now. Yes it can be, but you know Beethoven had horrible problems with clutter and hygiene in his later life. Mozart paid little attention to house work. Michelangelo would hardly shower and wore his boots day in and day out until when he finally took them off, a layer of thick dead skin came with it. You know I’m not making excuses, just something to keep in mind; should i be creative? Or pick up the clutter? 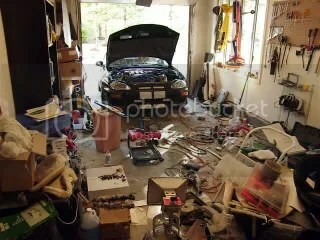 Lets just say, by show of example, clutter isnt always a bad thing. I mean the Sistine Chapel, Symphony number 9, and symphony number 40, just as a few good reasons why creativity should sometimes be put over the need for no clutter. Not paying attention to the room around you because you are creating and deliberately hoarding material items are two different things. An argument can be made for “the creative mind” but what can you say about that guy who saves shoestrings and cheese rinds “just in case”? Clutter is the result of not being able or willing to throw out junk. Good point! Inevitably, I guess, if you are at constant work to be creating something other things get neglected in order to reach that goal. And unless that person is MacGuyver, the shoestring and cheese probably will never come in handy. Oh…I thought you were asking me for my Golden Girls stuff, no way in hell man. You can get your own Dorothy Zbornak doll. Now if only I could find it in my big pile of toys…damn clutter.